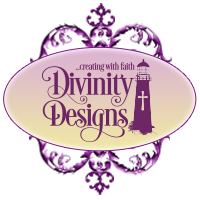 Divinity Designs, LLC Blog: ODBD's 10th Anniversary Celebration and a $10 Gift Code!! 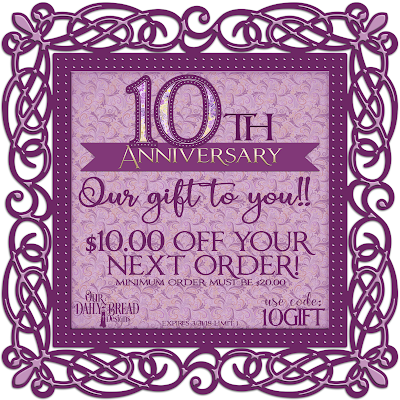 ODBD's 10th Anniversary Celebration and a $10 Gift Code!! 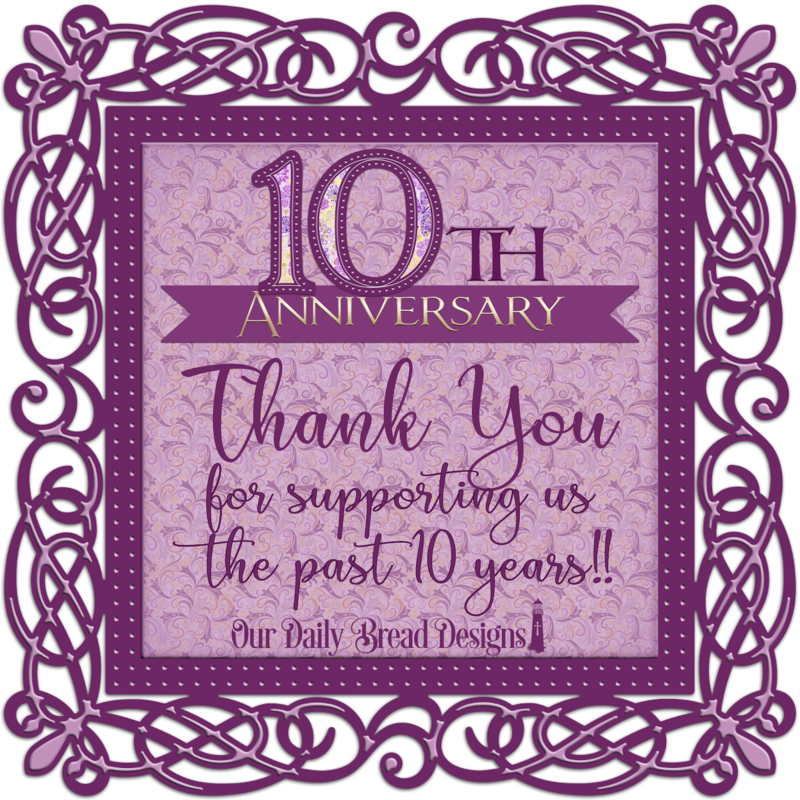 Welcome to Day 1 of our 10th Anniversary Celebration! 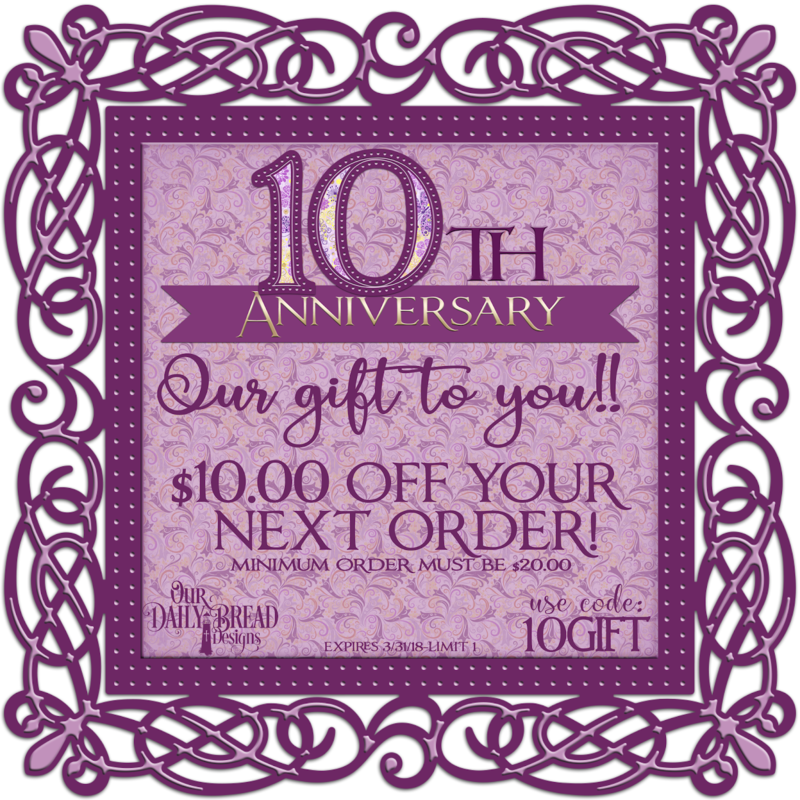 Today we are kicking off our week of celebration of Our Daily Bread Designs' 10th Anniversary! 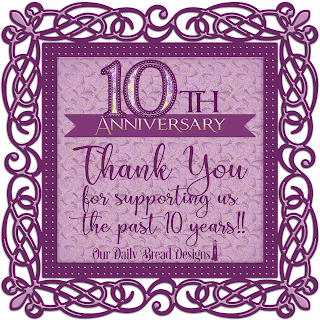 I am so overwhelmed to even be here to say to you that this is our 10th anniversary!! God surely had plans for me and the rest of ODBD when He put it in my heart to have the courage to start Our Daily Bread Designs. My husband, Rick, has been my constant supporter and had the faith in me to not only finance the start up of my business but to still be cheering me on 10 years later. ODBD has been not only a job, of course, but oh, so much more! I get great delight and satisfaction when I receive emails from customers thanking me for our products that are used in their ministries. Many groups make cards for churches, nursing homes, cancer patients and other charitable organizations. Along with our Christian stamps, we have developed a wonderful product line of custom dies and paper pads, which all coordinate and work together so beautifully. My hope is that the non-Christians, or those who have fallen away from their faith, who come to us looking for dies and papers, may then begin to read our stamps, and that they may come to know God and begin the learning and healing process! God has surely blessed our company and I pray that we may continue to bring to our customers around the world more stamps, dies and paper pads to aid you in your card making, scrapbooking, bible journaling and home decor projects. We thank you for your continued support of ODBD through your phone calls, website orders and social media comments! All this wouldn't be possible for us to be here if it wasn't for all our loyal customers. So that is why we decided to give YOU the gift...with a gift of $10.00 off your next order!! Shop our website from now until March 31, 2018 and receive $10.00 off your order of $20.00 or more. Enter the code 10GIFT to receive your savings!! Stay tuned this week for more of our 10th Anniversary Celebration and especially our 2018 Special Releases on Saturday!! Congratulations today and many years ahead as well. HAPPY ANNIVERSARY ODB!!!! God is SO GOOD to give us the desires of our hearts! Keep up the good work for the Kingdom!!!! ;) We're with you!!!! Congratulations on your 10th anniversary! I'm so happy to have found you! Congratulations on 10 years! Your company is such a blessing to so many! Congratulations Kelley!!! So excited for you! Congratulations! And for many more!! !